Close To My Heart is celebrating their 30th Anniversary. I learned about them nearly 14 years ago. To think that they were in existence 16 years before I heard of them...oh, the pain of it! So much paper and stamps that I could have bought! LOL Anyhoo, one of the things that always amazes me are the number of people that I run into that say "What is Close To My Heart?" WHAT?! How do so many people not know about the greatest company ever?! This brings to mind something that I learned from Presidential Director Noreen Petty at CTMH's Annual Convention this past June. She talked about sharing CTMH with everyone, something that I know I don't do well enough. Since I want to grow my CTMH business, it only makes sense that I need to share what Close To My Heart has to offer with more people than I have in the past. I've begun this mission of building my business by improving my blogging presence (a whole week of posts...woohoo!...hey, it's a start.) Now my next goal is to get CTMH into the hands of as many people as I can. This is where I could use your help. Home Gathering: You invite a few friends over and I bring all the supplies for you and your friends to try CTMH products and create a lovely project. 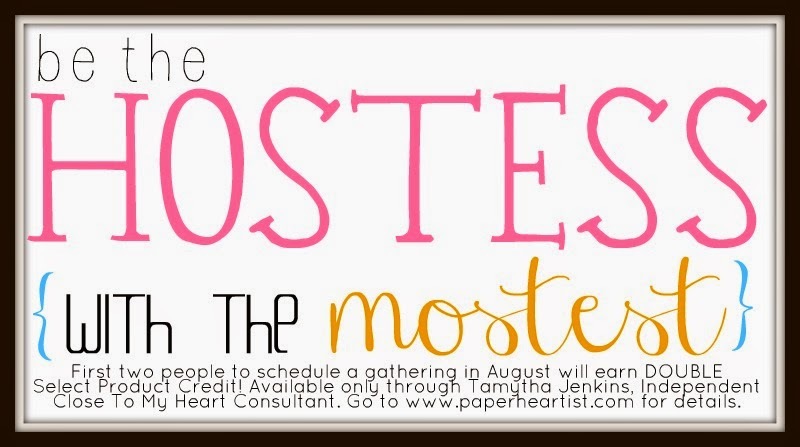 You can also increase your hostess rewards by combining your home gathering with an online gathering. Online Gathering: I'll send you an email that you can forward to all of your friends and family. They simply will go to my website (paperheartist.ctmh.com), select your gathering and shop. Their purchase will ship directly to their home. Catalog Gathering: I'll send you an Idea Book and several order forms and you can share the Idea Book with family, friends, co-workers, etc. Of course, in the digital age, you're able to reach more people with an online gathering, but the face-to-face sharing is great, too. So what do you get for all your efforts? You will receive a new Idea Book, a free stamp set and select product credit as outlined below...PLUS...for the first two people that schedule any type of Gathering in August, I will DOUBLE the Select Product Credit*! For example, if your gathering orders reach $450, you will receive 2 half price items and $160 in free products!!! And keep in mind that the new Idea Book starts August 1st! What a great time to get free goodies! Maybe you would like to get the new Artfully Sent Cricut Collection for half price? Or is there something else you would rather have? If you want FREE and half price Close To My Heart products and/or you would like to help me reach my goal of holding at least two Gatherings a month, please CONTACT ME so I can save the date that works best for you or set up your online gathering.